A low-key, luxurious retreat with a residential feel ideal for couples in search of romance. The large outdoor pool is perfect for relaxing and catching rays. 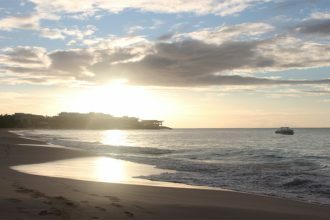 All images courtesy the Ritz-Carlton. 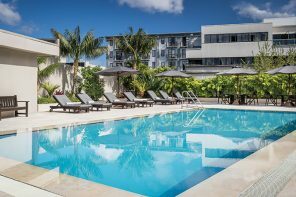 The Vibe: A tranquil, but luxurious retreat in Bal Harbour village, the Ritz-Carlton Bal Harbour is the ideal setting to sit back, relax and indulge. With the majority of the building occupied by residents and north of the action of South Beach, it’s a low-key destination with a residential feel that’s ideal for couples in search of a romantic escape. 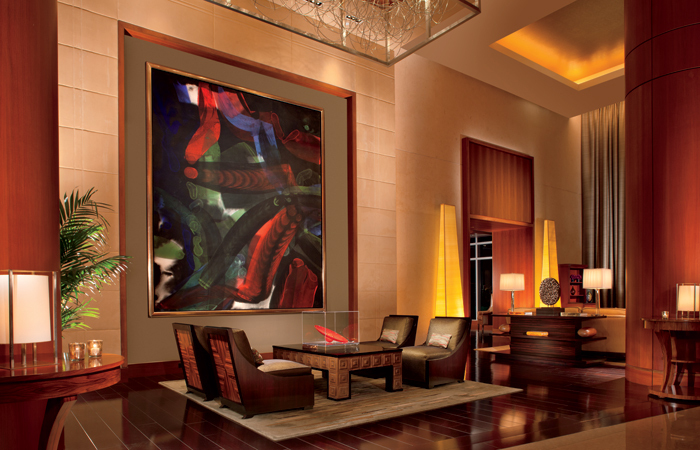 The lobby includes a selection of art from their $4 million collection. The Facts: Formerly ONE Bal Harbour, this 124-room hotel transformed into the Ritz-Carlton in late 2014, but without launching into any major renovations thanks to the high-end finishes that were already in place. Overlooking both the Atlantic and the Intracoastal, you’ll find a white-sandy beach just a few steps away from the pool, where you can pull up a lounge chair and get a little sun. Guests can receive service on the beach, so you can order a drink or snack without having to lift a finger. 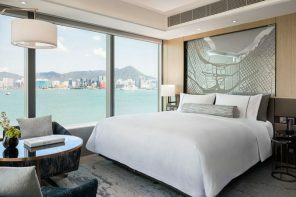 The rooms and suites are large, and all include terraces, plush bathrobes, Asprey bath products, large flat-screen TV’s and Bose Surround Sound Systems. 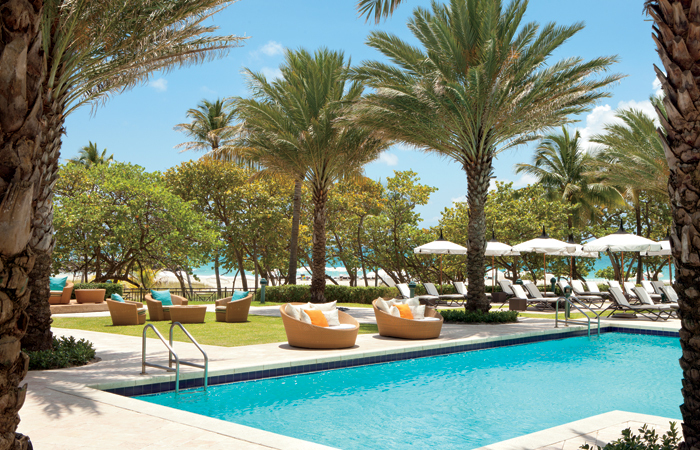 For dining, there are two options, the Bistro Bal Harbour, and the more casual Pool Bar & Grill for light snacks and cocktails. 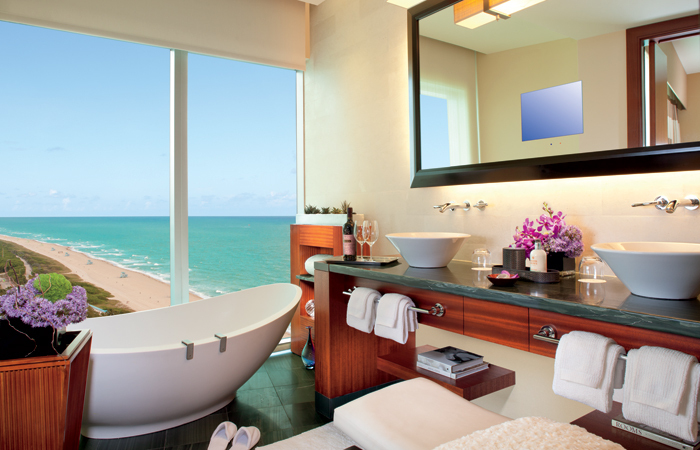 A luxurious bathroom in an Ocean View and Oceanfront Room. For activities, hanging pool-side is a popular choice. Aside from the lounge chairs, you an also rent a private luxury cabana with or without a Jacuzzi for a full or half-day. There’s also a 24-hour Fitness Center and bicycles that are free to borrow. Even better there is an excellent walking path between the beach and the hotel where you can bike, walk or jog. During our stay the spa was under renovations, but will soon open as an Exhale Spa, offering 10 private treatment rooms and their selection of award-winning treatments ranging from facials to massages. By April 2015, a 1,000 square-foot mind body studio with a waterfront terrace will open with Core Fusion and yoga classes. A partial Ocean View room. The Experience: The A-list treatment starts the moment you step onto the property. We were greeted with warm welcomes from everyone, who were staying on top of every detail with the help of their earpieces. Arriving hours before check-in, our room wasn’t ready, so the front desk agent suggested we head to the hotel’s restaurant. We were pleasantly surprised to see a lot of healthy options on the menu and some deliciously decadent picks too. The service was a tad slow near the end, but otherwise everything was perfect (every piece of fruit on the fruit platter was just right) and before we could ask for the bill we already received a call saying our room was ready. One feature of the hotel we appreciated were the private elevators. 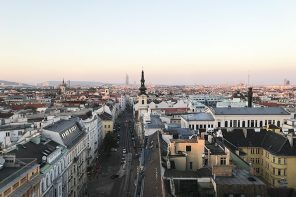 The hotel is divided into towers (some of which lead to residences), with each elevator leading to only two separate rooms. There’s a sense of both privacy and security when you reach your own private alcove before entering the room. Staying in a Partial Ocean View One-Bedroom Suite on the second floor gave us a view mostly onto the Intracoastal, with the nearby highway quite visible (not ideal for relaxing on the terrace). From the bedroom it was a less pleasant view of the front driveway, so for the most part we kept those blinds closed. Views aside, the actual Suite was big enough to entertain a decent group of people. There was a full gourmet kitchen, 10-foot floor-to-ceiling windows, two large flat screen TV’s, a walk-in closet and huge shower. Enjoying the sunshine was a priority so we headed down to the pool. There are little extras that add a nice touch, such as the sunscreen and after-sun lotion station set up by the towels, as well as the fruit-infused water. It’s almost hard to pick a place to relax, from the lounge chairs to cozy daybeds, but the ultimate is a private cabana. For $99 (half-day) or $199 (full-day), your private cabana with Jacuzzi includes a fruit plate, bottle of Prosecco and still or sparkling water. If you’re into people watching this isn’t the place, but it is perfect for two people looking for a little privacy. When you’re in the mood for a change of scenery, just down the road is the not-to-be-missed Bal Harbour Shops. This luxury mall contains exquisite dining options and the best high-end designers in the world. Even if you didn’t bring your car, the concierge will happily drive you in their house vehicle when available. The highlight of this hotel, aside from the almost boutique-feel thanks to the limited number of rooms, is the pitch-perfect, friendly service. It doesn’t feel forced or stiff, more like a genuine desire to make your stay one to remember. Good to Know: Extras can add up here. There is a daily resort fee of $25, which includes items like the use of the hotel bicycles, in-room Internet and beach activities. Drivers be forewarned too. The overnight rate is $32 per night to park your car. Room to Book: The higher you go, the better the views and an Ocean View room certainly won’t disappoint.